Support the club by entering our prize draws for a rod, reel, line or box of flies. Roll up! Roll up! Superb prizes to be won! Good news! We have two raffles again this season, thanks to Aaron Phillip stepping in to tie flies for the club. The raffles for Willie Thomson’s fly boxes were extremely popular over the last few seasons, and the club is hoping for a similar response from members to support Aaron’s superb gesture. 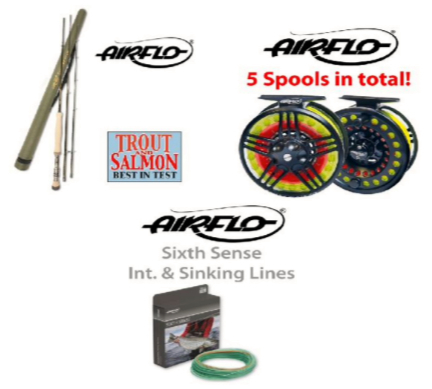 The prize in Raffle One is an Airflo rod, reel or fly line, sponsored by Neil Anderson at Angus Angling, Forfar. Raffle Two is for a fly box with a selection of assorted flies. Entry to each raffle costs £7 for seven monthly draws over the season. Raffle One is for an Airflo rod, reel or fly line, donated by Neil Anderson, Angus Angling, Forfar. Raffle Two is for a fly box with assorted flies tied and donated by Aaron Phillip. Simply print and complete the following form, then send it to Mr Steve Carmichael, Membership Secretary, 81 Dalhousie Street, Monifieth, DD5 4EP. If using direct payment, please use the email form below. In the “message” field, simply let us know what you are paying for, and how much you are paying, after proceeding as above. If entering the Rod, reel or fly line raffle, please tick YES or NO on the form below, and agree to pay £7 for seven draws. If entering the Fly box with flies raffle, please tick YES or NO on the form below, and agree to pay £7 for seven draws. NB – You can enter the draws as many times as you wish. Just multiply the number of entries by £7. Name . . . . . . . . . . . . . . . . . . . . . . .. . . . . . . . . . . . . . . . . . Membership Number . . . . . . . . . Phone Number . . . . . . . . . . . . . . . . . . . . . . . . . . . . . . . . .
Rod, reel or fly line raffle . . . . YES . . . . . . . . NO . . . . . . . 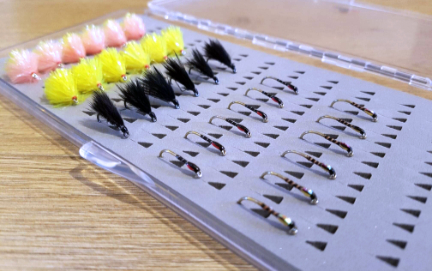 Fly box with flies raffle . . . . . . YES . . . . . . . . NO . . . . . . .
Total amount I am paying. Please circle £7, £14, or Other Amount, in case of multiple entries. Please state total amount . . . . . . Signed . . . . . . . . . . . . . . . . . . . . Date . . . . . . . . . . . . . . . .